Dr Justin Evans and a band of fellow particle physicists are leading an international quest into the unknown to help find a ghostlike neutrino particle – its discovery promising to be even bigger than locating the Higgs boson. 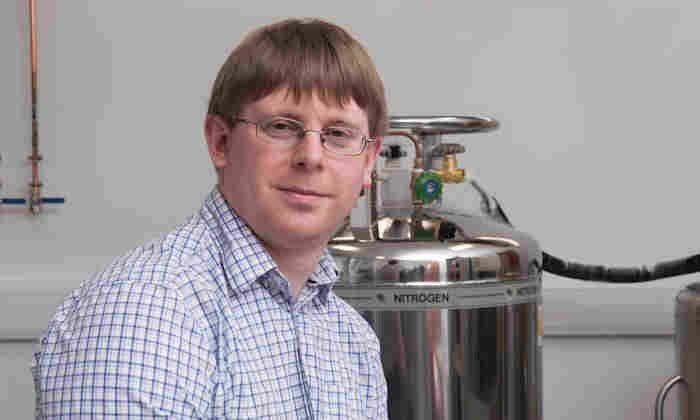 Tuning into his favourite breakfast radio programme one morning, Manchester physicist Dr Justin Evans was astounded to hear his highly specialised research to help unravel the mysteries of the cosmos being shared with millions of listeners by a leading philosophical thinker. Religious philosopher and scholar Rabbi Lord Jonathan Sacks was highlighting the “wonder” and importance of understanding the role of the neutrino in the evolution of the universe. Rabbi Sacks’s comments on BBC Radio 4’s Thought for the Day came shortly after the University published a news story on Dr Evans’s groundbreaking work to help locate the elusive ‘sterile’ neutrino. “At first, I was shocked to hear this highly niche work in particle physics being discussed,” said Dr Evans, a senior lecturer in particle physics at The University of Manchester. Neutrinos are believed to have played a critical role in shaping the universe immediately following the Big Bang. The experimental work of Dr Evans’s team involves firing a beam of neutrinos 735 km between labs in Chicago and Minnesota, as well studying neutrino activity at a nuclear power plant in the Guangdong province of China. He says the subatomic neutrino attracts such special attention because compared to other particles in the standard model of cosmology – including the Higgs boson, the so-called ‘God particle’ that helps provide mass to all other matter – they are so “weird” and anomalous. Dr Evans is confident that the research he’s involved with will lead to discoveries that will be recognised as a landmark scientific achievement. “Finding a sterile neutrino would be an even bigger discovery than finding the Higgs boson,” he believes. “The Higgs boson was a prediction of the standard model of particle physics – a system that attempts to describe the basic particles that make up matter and the interactions between them. Therefore its discovery, although momentous, wasn’t a surprise. However, the sterile neutrino we’re looking for would be physics beyond the standard model.